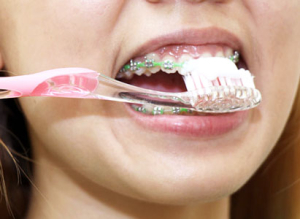 Taking good care of braces can help prevent damage to the braces themselves and the teeth underneath as well as make the braces more comfortable to wear. Learning the basics of orthodontic care will help you follow your dental professional’s recommendations to keep your teeth and gums healthy during the time you’re wearing braces. During the time that you have braces on your teeth, you will need to visit the orthodontist regularly for adjustments to your appliance. After a routine orthodontic adjustment, you may experience some tightness or even a slight amount of pain. If this discomfort or pain does not quickly dissipate, or becomes extreme, you should consult your orthodontist. Concerns about your appliances, and any problems with broken parts, should also be brought to your orthodontist’s attention immediately.